Summary: When you are intending to take your food in a historical hotel in Vijayawada, make it a point to visit Babai Hotel. 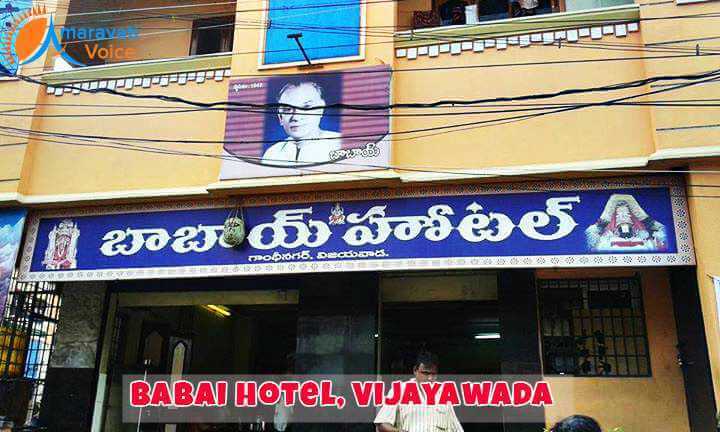 Babai Hotel is actually a landmark of Vijayawada known for their mouth-watering dishes and octogenarian customers. Yes, this hotel has a longer existence. The hotel has been around from around 1950s. When walking down the memory lane one of the regular customers, who is at his 80s reminds that the hotel was serving around just a dozen of customers at a time with its little space. The owner of the hotel Mr.Patruni Samba Murthy was addressing each of his customers as Babai, which means uncle regardless of their age. This hotel is popular for its idlies and many of their customers were and still are slaves for the tasty idlies offered at this hotel. Earlier, idly and pesarattu were the only items available for breakfast at this hotel and generally the breakfast time closed at 8 am, after which it was not possible to get the tiffin. Now, let us get into some interesting facts about this historical hotel, which still functions in the city with similar mouth-watering dishes as earlier. The actual year of establishment of this hotel is 1942 and Patruni Samba Murthi was the first owner, who became popular as ‘Babai’ to every customer. Due to the tasty dishes, the customers were paying more as compared to their actually bill amount. Babai passed away in the year 1985 and the hotel came to his nephew, Chanti. But, Chanti found it highly hard to maintain the name and fame brought to this hotel by Babai. But, he still managed to do it. When the hotel came to the hands of the successors of Chanti, they completely renewed the building and the atmosphere was completely changed and they added few more foods like pongal, podi dosa, masala dosa and Godhumma ravva upma to their recipes. But, the taste never deteriorated and the new management managed to offer the best taste as earlier to their customers. Many great personalities from the Telugu film industry like NTR, ANR, Savitri and even politicians continued to be frequent visitor to relish the tasty dishes offered at Babai hotel. Even though, the foods were cheap for celebrities at Babai hotel, they had great liking for the foods served in this hotel as against visiting five star hotels. Even though, several years have passed by, Babai Hotel still continues to maintain the taste of their idlies, chutneys with coconut, ginger and chilli powder along with ghee and butter. The former chief minister of the state NT Ramarao and he himself once served the idlies of this hotel to great national leaders like Atal Bihari Vajpayee during Mahanadu in 1988. Recently, the hotel was completely renovated and was opened after a short close for renovation work. V. Lakshmi Narasimha Rao, a nephew of ‘Babai’ and who is known as Chanti, is managing the affairs ever since ‘Babai’ passed away in 1985. After renovation, the hotel has now come up as a Ground+2 building at the same 130-sq. yard site. The ground floor is ‘self-service’ section, though a couple of tables would be arranged there to make it easy for elders. The top floors would have about 25-30 seating capacity each.